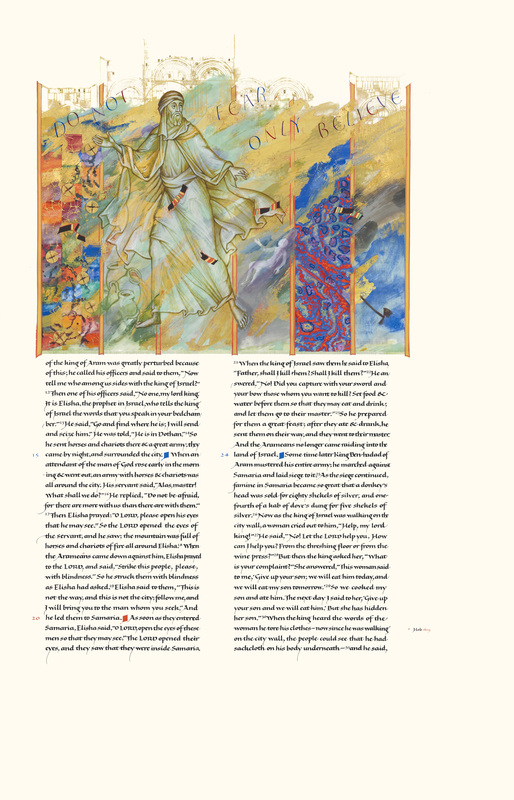 The Saint John's Bible Heritage Edition is a modern, illuminated manuscript bringing all the traditional elements of handwritten texts into a Bible that one can behold with the eye in order to slow down the mind and enter into this living book, all the while igniting the spiritual imagination. Elisha and the Six Miracles, Donald Jackson, 2010 The Saint John’s Bible, Order of Saint Benedict, Collegeville, Minnesota. Scripture quotations are from the New Revised Standard Version of the Bible, Catholic Edition, © 1993, 1989 National Council of the Churches of Christ in the Unites States of America. Used by permission. All rights reserved.